United Bank for Africa (UBA) Plc’s N30.5bn bond has been listed on the Nigerian Stock Exchange (NSE) and Nigeria’s premier debt capital Securities Exchange, the Financial Market Dealers Quotation, Over-the-Counter (FMDQ-OTC) market. The dual listing was done on Wednesday April 8, 2015. Listing on the NSE provides opportunity for retail investors to take advantage of the fixed return on the investment grade Notes, through the primary market whilst listing on the FMDQ will provide a secondary market platform for institutional and foreign investors to trade UBA Bond. The UBA Bond is the first corporate bond to be admitted on the FMDQ platform and the first of its kind on a fixed income OTC in Africa. Chief Executive Officer, FMDQ-OTC Mr. Bola Onadele Koko, commended UBA for being a pioneer in the market and reiterated the FMDQ’s commitment to the development of the Nigerian financial markets, through its efficient platform for the registration, listing, quotation and valuation of bonds. He said the benefits of listing on FMDQ include “global visibility and transparency, improved secondary market liquidity, price formation and benchmark pricing thus resulting to a more globally competitive capital market”. 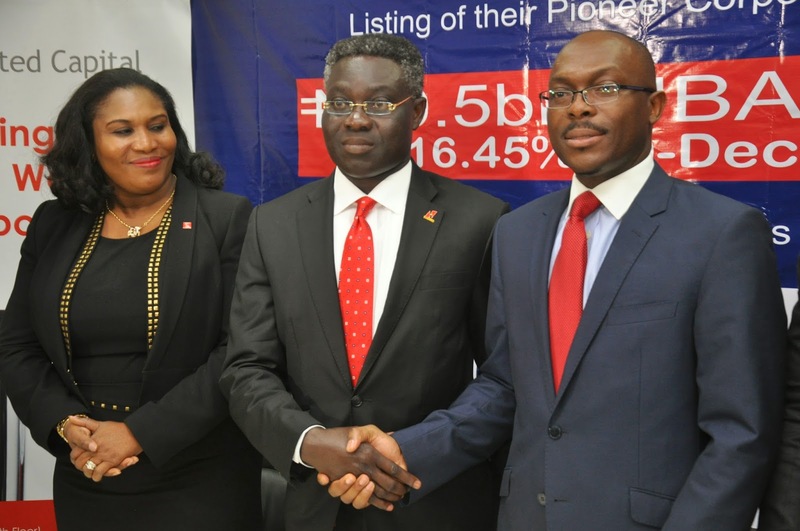 UBA, in December 2014, successfully raised N30.5 Billion Tier-II Capital through the issuance of Seven-Year Fixed Rate Unsecured Notes, maturing in 2021. “The bond issue was the biggest and most successful in 2014. The success recorded at a time of uncertainty in the capital market was largely due to the credibility and strength of the UBA brand” said Mrs. Oluwatoyin Sanni, Group CEO, United Capital Plc and Issuers to the Bond. Group Managing Director/Chief Executive Officer, United Bank for Africa (UBA) Plc, Mr. Phillips Oduoza, expressed delight that the UBA Bond is the first to list on the FMDQ. “We were the first Nigerian bank to do an Initial Public Offering (IPO) on the Nigerian Stock Exchange (NSE) after successfully listing in 1971. We were also the first to issue Global Depository Receipts (GDR) in 1998. We are always willing to explore new frontiers in our quest to have an efficient market that meets our developmental needs” said Oduoza. The UBA Group is a diversified financial services provider and one of the largest financial institutions in Africa, with presence in New York, Paris and London. “We will utilize the proceeds of the Bond issue for long term commercial and retail sector lending as well as the expansion of our delivery channels to provide efficient banking services to our customers” he further stated.